The international standard for service management ISO/IEC 20000 has been updated for the second time since it was published originally in 2005. It has been released on September 15, 2018. 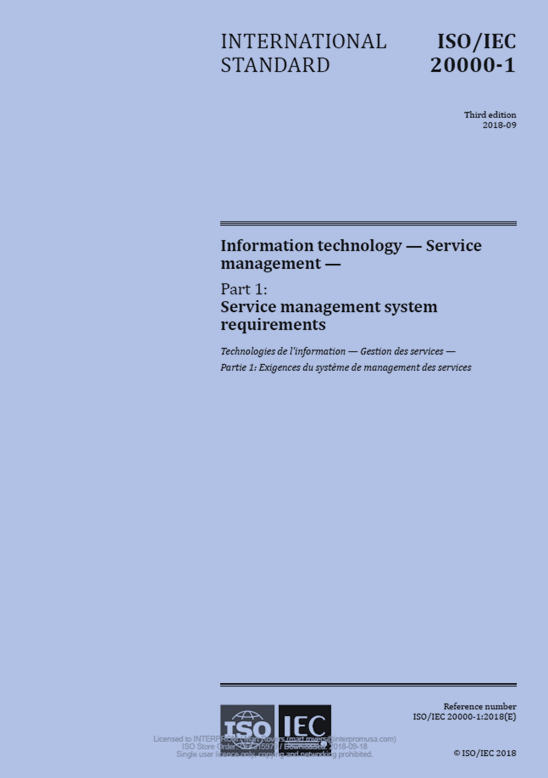 When looking at the new version or edition three, as the ISO/IEC JTC 1 committee for Information technology, SC 40, IT Service Management and IT Governance calls it, the current trends and challenges regarding service management have been taken into account. The focus of the 2018 version is even more on management and quality assurance and much less on the design and implementation of processes and procedures. A service provisioning ecosystem composed of a multi-service-provider environment emphasizes more on the management of quality services than unifying all processes across all participating organizations. Here are some of the main differences of the 2018 edition of ISO 20000 compared to version two of the standard which was released in 2011. 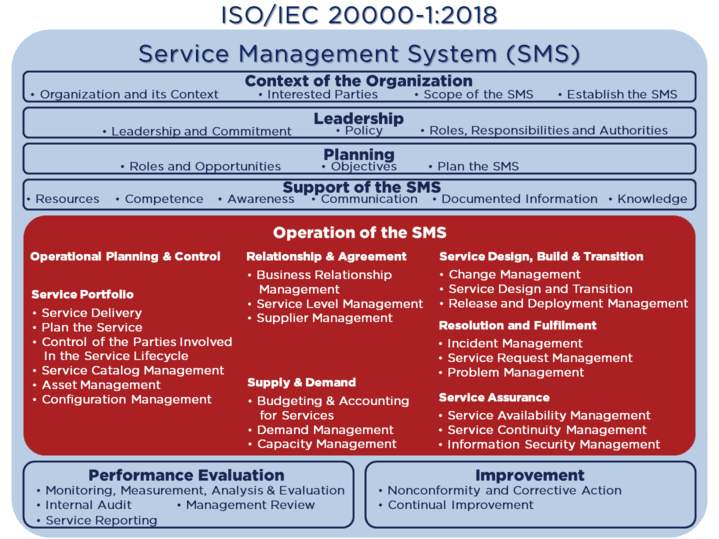 The new service management system (SMS) of ISO/IEC 20000-1 shows additional processes and increased emphasis on aspects such as leadership, risks and planning. At first glance, the new standard appears to be more extensive and have become more complex; the 2011 version requires 14 processes and the 2018 version implies the need for 20 processes or practices. However, the requirements for the respective process topics are much less and the documentation requirements have been greatly reduced from 256 to 212. This allows organizations to define their processes much more freely. The standard is now more geared to effective service management than to its detailed descriptions. As a result, the focus now is much more on topics such as leadership & commitment, risk management, service planning, and performance evaluation and improvement. Another result of the standard being less prescriptive is that service provider organizations other than IT service providers may find it easier to benefit from the standard’s guidance on implementing a management system that enables for the delivery of effective and quality services. For companies that are already ISO/IEC 20000 certified, the transition must be well prepared, but the changes will not be really big. However, it is recommended to agree on the transition date with the certification body. In most cases, you will have until September 2021 to recertify against the 2018 version of the standard. For companies who seek compliance with the ISO/IEC 20000-1 requirements for the first time, this will be easier because the new version of the standard is less prescriptive and is more focused on what organizations need to do, and thereby having more freedom in the implementation of the standard’s best practices. Also the other parts of the standard, such as the guidance provided in ISO/IEC 20000-2, are already planned and can be expected early 2019. In short, the 2018 version of ISO/IEC 20000 is easier to interpret, is more coherent and more complete, is less prescriptive, and is a better reflection of today’s services industry with integrated service value chains across multiple organizations. INTERPROM offers an online ISO/IEC 20000 Transition Guide for organizations seeking a boost to meet the new requirements. Which requirements have been removed? Which requirements have been revised? How do each of requirements of the 2018 edition map to the requirements of the 2011 version of the standard? What are the new terms and definitions? How to interpret the new requirements? How to migrate to the new standard? Stay Tuned! We’ll update this blog and include a link to the course. Mart has over 30 years of experience in IT and has been consulting and training in IT Service Management, Information Security Management, Enterprise Risk Management and IT Governance since 1992. He is the President of InterProm USA Corporation, he is a Board Member of the Arizona ITSM Professionals and he currently serves as the President of the ISO/IEC 20000 Special Interest Group. Mart is a certified ISO/IEC 20000 Internal Auditor and Executive Consultant/Manager (Master). He holds the ITIL® v3 Expert certification along with ISO/IEC 27001 Professional and Internal Auditor certifications. He has led numerous organizations towards becoming ISO/IEC 20000 and ISO/IEC 27001 certified and is an accredited instructor for ISO/IEC 20000, ISO/IEC 27001, CBRM, BRMP, COBIT, VeriSM, Cybersecurity Fundamentals and ITIL training courses. Mart is also the author of the “ISO/IEC 20000 – A Pocket Guide”. ITIL 4: It’s a System!